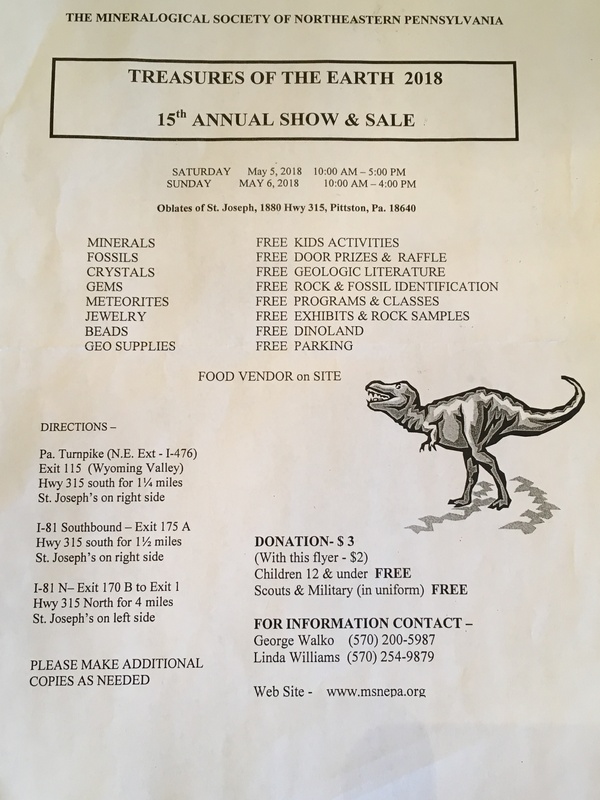 The Fiesta of Gems is a free educational event for the community which provides fossils, gems and mineral exhibits, demonstrations, and children’s programs. We also offer jewelry making classes, gem, mineral dealers, tools, and books sales. This event helps several community programs in Culver City and helps to educate and inspire elementary students in Earth Science activities. It also enables the Club to provide donations to the El Rincon School, to the Culver City Boy Scouts, Troop 113, and the Culver City Senior Center. Fiesta of Gems Show offers over 35 gem and mineral dealers from California, New Mexico, and Arizona who will sell minerals, gems, slabs, cabochons, beads, and jewelry findings. The Culver City Rock and Mineral Club members will exhibit gem and mineral works of art, jewelry pieces, and private collections of gems and minerals. There will be classes throughout the weekend introducing various techniques of jewelry making. For more information on the 57th Fiesta of Gems Show or the Culver City Rock and Mineral Club, contact Janice Metz at culvercityrocks35@gmail.com or refer to our website http://www.culvercityrocks.org/. May 6 – 7, 2017 is our 13th Annual Gem & Mineral Show, at the Oblates of St. Joseph, 1880 Hwy 315, Yatesville, PA (just outside of Pittston, PA). This is a must-do event! Great times for the whole family, many of whom make a point of returning year after year. We charge a flat rate of $150 for 12 month basic partnership and offer much more than other mineral sites. Send us two banner ads, 728×90 and/or 150×150, that we will post on our website. As an add-on service, send your club announcements and show announcements for us to post over our famous American Geode Twitter with 10,000+ rockhound followers, fans and friends. From attending, volunteering for, and being members of gem and mineral clubs in New York, Texas, Pennsylvania, and attending camps, seminars and intra-club retreats with people from all over the United States, we consider ourselves gem, mineral, and fossil club aficionados. 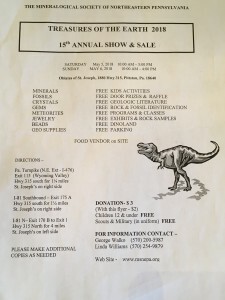 So whether you are considering joining a gem and mineral show for the first time that perhaps you found on an events page, or you are a veteran of gem and mineral clubs, this primer on clubs will prove to be a valuable resource on what to expect from a gem and mineral club and how to have more fun. First, consider what you are seeking from a club. Is it the academics and education of gemology, geology, paleontology, or archaeology? Are you seeking rockhound partners and buddies? Are you seeking to use a work-shop for cabochon or lapidary arts? Are you seeking fellowship with a group that meets outside of their monthly meetings? These are questions to ask as you search for the club that is right for you. So join more than one club, to have access to a workshop when you need it, field trips in the spring and fall, the chance to hear academic and scholarly discussions in geology and paleontology, and make new friends during the whole gem and mineral club experience! Now the source and formation of Herkimer Diamonds is of particular interest to us here at American Geode because the Herkimer Diamond was formed in “pockets” not unlike the pockets that formed geodes. Most quartz crystals grow, over the course of millions of years attached to a matrix, attached to the surrounding rock or stone. So in those formations only one end of the quartz crystal grows to its point. With Herkimer Diamonds forming inside pockets, freed from the surrounding matrix stone, they grow points on both ends. The Herkimer Diamond began forming nearly 500 million years ago in pockets within a sedimentary rock called Dolostone (Dolomite and Limestone). Sedimentary rock, different from its two cousins Igneous rock and Metamorphic rock, is formed by layers of mineral and organic matter under hundreds of million years of pressure. As more layers of mineral and organic matter are deposited, this increases the pressure and weight on the lower and earlier layers of sedimentary rock below. The Dolostone covered Herkimer County during the Cambrian Age, when Herkimer County was also the bottom of the sea that spanned across North America. Now this is the part of the Herkimer Diamond formation that is similar to the way geodes are formed: organic material, plants and sea life would die and be buried under new layers of sedimentary stone. When these plants and other sea life would decompose under the rock, they release gases, and this gas is what formed the “pocket.” Evidence of this organic, plant material succumbing to decomposition is clear when you see the black shiny flakes of Anthraxolite that surround or leak from these pockets. Anthraxolite is a carbon compound and by-product formed when organic material breaks down. So as the organic material decayed and broke down it became a gas, trapped below layers of sedimentary stone. Air creates its own pressure inside a substance, so the air pressure was carving out its own cavity from the inside out. These air pockets became the pockets we rockhounds discover as we crumble, break, and peel away layers of the dolostone. Over the course of 200-250 million years the layers of sedimentary rock increased and grew, and this increased the pressure and heat on the buried dolostone. Also inside each of these air pockets were various quartz and carbon elements and other compounds “feeling the heat” from being buried below layers of sedimentary rock. Under this pressure of the sedimentary layers of rock, and the ensuing heat, the quartz and other compounds inside these pockets began to transform themselves. Finally, over the course of 300 million years, the glaciers that sat atop Herkimer County began to melt, and washed away layers of the sedimentary rock, and allowed the compounds and elements inside these pockets to cool down and then crystallize. An important question to answer right now is “why are the Herkimer Diamonds double-terminated?” The answer is that quartz does not adhere to the dolostone, therefore the quartz trapped inside these air pockets did not attach to the surrounding matrix host stone. The process left the quartz crystals free to fully crystallize unattached and allowed both of the ends to grow into fully terminated points. Many Herkimer Diamonds are found as clusters attached to one another. They adhered to one another during their crystal growth formation, but again did not adhere to the dolostone interior of the air pocket. The value of Herkimer Diamonds is determined by size and their opacity or translucence. The larger and more translucent Herkimer Diamonds are worth more to a collector or jeweler than the smaller opaque specimens. Knowing the history and background of the Herkimer Diamond however lends a premium in our opinion when you are considering adding Herkimer Diamonds to your collection. They are not commercially mined due to various New York state laws limiting mining in the state, and most of Herkimer County is being used today by happy grazing cows, sugary apple orchards, tart cherry trees, farms of squash, cabbages and onions, and wine grapes. We have recently gained access to heretofore unmined and barren acres in the Herkimer County area on the same geologic slope and ledge as the traditional Herkimer Diamond mines. We are in consultation right now with the owner about constructing a pole-barn over this new Herkimer mine so we can mine year-round. Gem and Mineral Clubs can Recruit More Members! 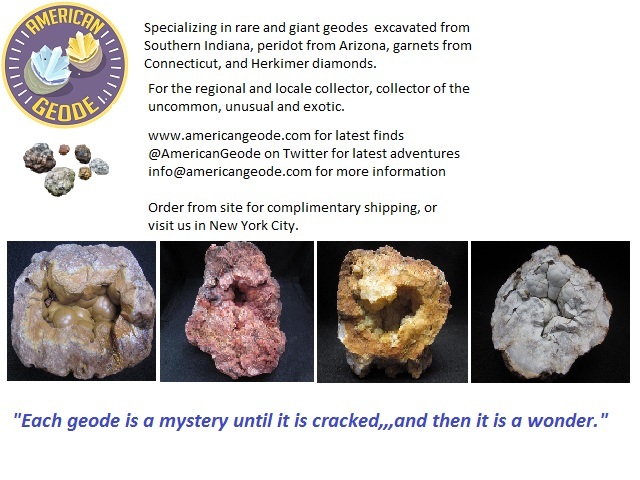 American Geode team members have the good fortune of being members in good standing with many different gem and mineral clubs from New York to Pennsylvania, Vermont to Texas. We have also been vendors at many shows hosted by gem and mineral clubs, and supporters and buyers to even more different shows organized by gem and mineral clubs throughout the US and Canada. 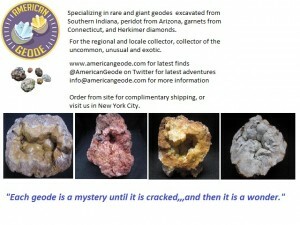 In addition to gems, minerals, geodes, fossils and rockhounding, American Geode has decades of experience in SALES. With this essay, we would like to share tips, tricks and advice for gem and mineral clubs to recruit brand new members! 1. Less is More! We have been to many gem and mineral club tables at various shows, and while giving gifts to prospective members is a nice gesture, usually it’s too much too early. The result can backfire on you! The person has just arrived to the show, they don’t want right from the start to be carrying papers and flyers and bulletins and free sample minerals. That does not create a desire or need for that person to join your club! 2. Don’t “hot box” your prospective members when you meet them! The term “hot box” means expending undue pressure on a person to join your group or affiliation. To the person being “hot boxed,” they will call it a “turn off.” Again, “Less is More.” Educate the prospect about the club, ask questions, that shows mindful and sincere interest in them and will appeal to them, and then “hook” them on the return visit. While the prospective member is touring the show and dealers, plan and prepare a relevant gift, relevant information and means to sign up when they exit the show. For instance, if the prospect says they are interested in rockhounding, have your field trip leader or officer, or someone who has been a frequent field trip rockhound, talk to the prospect about the last trip. Have a schedule planned for the upcoming trips to share! If the person is interested in lapidary and jewelry, be ready to discuss access to equipment if that is a benefit of your club, or discuss the other members who are lapidary experts and how often your meetings are about lapidary. The trick is to make the conversation relevant. While your club has many, many great things to offer, satiating and fulfilling someone’s rockhound or mineral need is going to sign up more users than sharing the other great, but irrelevant strengths your club has to offer. 3. How do you “hook” your new members? Prepare, prepare, prepare! When you meet them the first time, write down their name, note if they are with someone or their family. Be prepared to offer a family membership at the lower price point. Be prepared to sign up people THAT DAY! Have the forms ready, have plenty of pens, have pocket cash to make change if someone pays their dues with cash, and have someone be ready to take credit cards via Paypal device you can attach to your phone. Does your club offer on-line sign-up and membership? Then have a laptop ready for someone to sign up right there! Whether it’s retail sales, high-end luxury good sales, memberships to any organization, when people walk away, and you don’t get the sale, the chances of them returning to complete the sale later are as low as 5%. That would be a terrible shame when you have someone who is a “hot prospect” because they are at your club show! With these “sales tricks” we know you will succeed!